EDITOR'S NOTE: This post was updated Sept. 7, 2017, to reflect a change in penalities for violating the Steer Clear Law. Safety is the No. 1 priority at PennDOT. And keeping our roads safe takes a team effort — with Pennsylvania's many emergency personnel sometimes being the unsung heroes of the lineup. Emergency personnel are often the first on the scene of a crash — there to save the lives of those involved. But emergency personnel also are our partners in educating the public on ways to be safe. In honor of EMS Week (May 21-27), here are a few ways PennDOT aims to recognize and assist the men and women who put so much of their lives into helping others. If passing in a nonadjacent lane is impossible, illegal, or unsafe, motorists must slow down to pass at a "careful and prudent" speed. This is commonly referred to as the Steer Clear Law (PDF), and you can find it in Pennsylvania's Motor Vehicle Code. An important note is that the emergency response area DOES NOT have to be on the side of the road for this to apply. The crash can be in any of the lanes, and motorists are still required to move at least one lane away, if possible, or slow down to a prudent speed. The penalties for violating this law vary, but if convicted, you'll be required to pay at least a fine of not more than $1,000, and you may be suspended for up to 90 days. If your violation results in bodily injury to or death of a non-emergency responder, it will result in a 90-day license suspension and a fine up to $1,000. If your violation results in bdily injury to or death of an emergency service responder, you'll also lose your license for six months to a year and pay a fine up to $10,000. Yellow Dot is a program that assists citizens in the "golden hour" of emergency care following a traffic crash when they may not be able to communicate their needs themselves. Placing a Yellow Dot decal in your vehicle's rear window alerts first responders to check your glove compartment for vital information to ensure you receive the medical attention you need. The program is a cooperative effort between PennDOT, the state departments of Health and Aging, the Pennsylvania State Police, the Pennsylvania Turnpike Commission, first responders, and local law enforcement. Get more information on the program, or request a kit in the mail, on the Yellow Dot section of our website. PennDOT Driver & Vehicle Services also offers a program where you can add emergency contacts to a secure database. Law enforcement and emergency personnel then have access to that information to reach out to your contacts in the event of an emergency. Many specialty registration plates supporting various emergency personnel organizations are available through PennDOT. Check out our list of approved special organizations, and then contact your preferred organization for an application. PennDOT charges a standard issuance fee of $25 for special organization plates (or $125 for a personalized plate). The organization may charge an additional fee on top of that, which is paid directly to the organization. 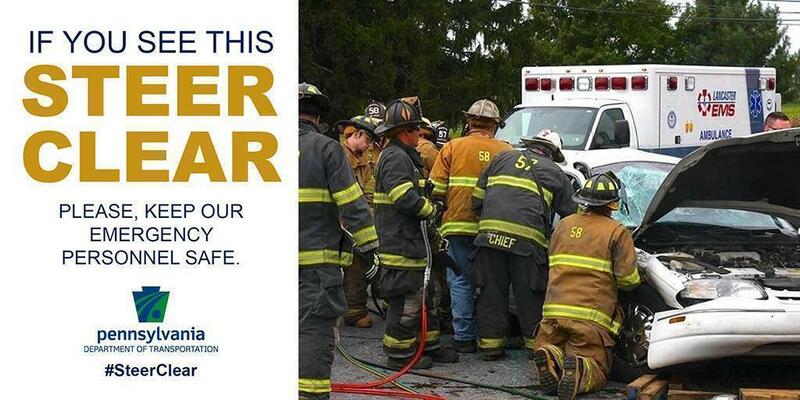 Remember, emergency personnel are an important part of keeping our roads safe. If you come across a crash scene, slow down and give the crews plenty of room to get their job done. And if you know an emergency responder, give them a big THANK YOU this week.